The Beatles are often considered the embodiment of perfection in terms of their musical output. For the most part, they never had a flop or suffered through a slump. The fact that they broke up while still in their prime, while causing heartbreak to their many fans, actually ensured that their recorded legacy would remain pristine. And yet throughout the years, some tiny errors worked their way into their songs. In most cases, the band knew about these little gaffes and allowed them to stay. These mistakes provide a fascinating glimpse at how the band perhaps took their own music a little less seriously than all of the people who loved it. Here are ten mistakes in Beatle songs that you might not have recognized. On just their second single and very first Number One hit in Great Britain, The Beatles’ loose-limbed approach to recording was already in place. Though they did several takes of “Please Please Me,” which was famously quickened from its original, stately tempo at the urging of producer George Martin, the one that was used actually contains John Lennon messing up the lyrics in the final verse. You can hear the discrepancy when he and Paul McCartney are attempting to harmonize with different words. The Beatles were always releasing singles right alongside their albums, putting out an incredible amount of product in a short span of time. In the case of this jaunty little track, it worked its way onto the B-side of the mega-smash hit “She Loves You” in late 1963. And, because of the tight schedule, a mistake in the lyrics to the bridge was allowed to stay. Again, Lennon is the culprit, but it doesn’t even stunt the momentum of the song, so fine are the Everly Brothers’ harmonies perpetuated by he and Paul. 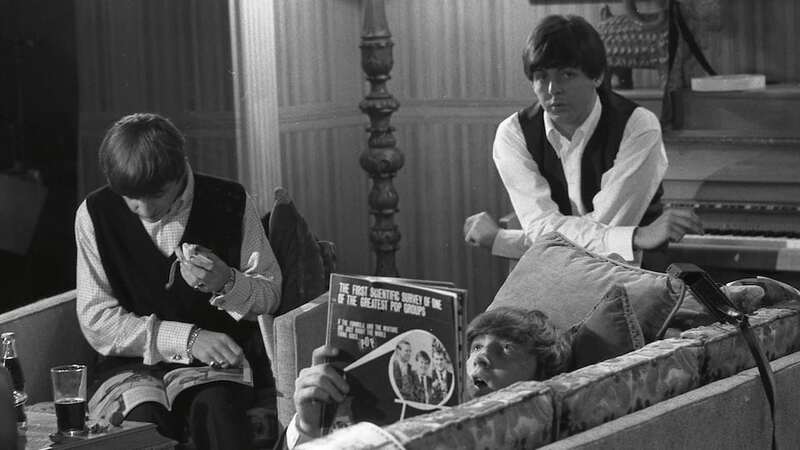 By the time the band got around to their third album, 1964’s A Hard Day’s Night, they were writing ballads of startling maturity and complexity to go with the rave-ups. “If I Fell” is a particular beauty, with Lennon vacillating between the choice of two suitors. The melody is wistful and yearning in all the right places, but when it surges to a peak at the end of the middle eight, McCartney’s voice audibly cracks as he strains to hit the high harmony. This is an example of a mistake that came up smelling like roses. Although the accounts differ, someone at some point during the recording of this late 1964 single leaned one of their guitars up against a live amplifier, creating some explosive feedback. Excited by this prospect, the band decided to include it in the opening of the song, with the squalling sound eventually morphing into George Harrison’s perfectly-picked lead guitar part for what would be a Number One smash. This is the first song to ever include a writing credit for Ringo Starr, although by most accounts it was just as much a Lennon/McCartney number as anything else. “What Goes On” is a bit of an oddball country track in the midst of the contemplative songs on Rubber Soul. Perhaps the band sensed it was a throwaway, because they let Lennon run hog wild with weird rhythm guitar stylings. They are buried down in the mix, but if you focus on them, you’ll hear how disheveled they were. This is a bit of a cheat since there is no known mistake to be found on the actual recording of this late 1967 Number One single. The problem came in the promotional video for the song, which was a relatively new innovation by The Beatles to atone for the fact that they were no longer touring. In the clip, McCartney can be seen obviously miming the lyrics (his mouth doesn’t synch up at one point in the “Bye-Bye-Bye” part). The clip would be kept off the air in Britain because the Musicians’ Union had a ban against such practices. It’s ironic that this song would be included here since McCartney allegedly aggravated the other group members with his insistence on endless takes of the White Album classic. But when singing the final verse, McCartney accidentally juxtaposed the occupations of Desmond and Molly Jones. When confronted with the mistake, he decided to just leave it in to give people something to think about. One could imagine that the other three Beatles were more than happy he didn’t insist on recording it again. It is the most hallowed of all Beatle ballads, Paul McCartney’s personal pick-me-up for a hurting Julian Lennon that became a universal expression of support in hard times. Yet Paul actually dropped an F-bomb in the middle of it. The reason is lost to the mists of time (some claim a bum piano note), but right about the time that McCartney is singing “Then you can start…” for the last time, you can hear him mumbling underneath something to the effect of ”f***ing Hell.” That will make you think next time you’re teary-eyed and singing along. This one isn’t so much a mistake as it is a case of something hidden by a quirk of recording. “Come Together” is notable as the opening track from The Beatles’ final studio album, 1969’s Abbey Road. In this bluesy workout, Lennon can be heard at the start of each section singing a “sh” syllable, and then his voice intertwines with the combination of McCartney’s bass and Starr’s maracas. He was actually singing “Shoot me” in an insistent whisper, but it gets lost in the recording shuffle. Ever wonder why the quick little final track on Abbey Road is introduced by a jarring guitar sound and comes so long after the previous track? Well, McCartney had intended the song to be a part of the elongated Side 2 medley, but then decided against it. Engineer John Kurlander was told by Macca to toss the song, but he didn’t want to throw away anything valuable, so he instead tacked it on to the end of a rough mix several seconds after the final notes of “The End.” When discovering it, the band liked how it deflated some of the sonority of the closing tracks and left it there, complete with the jarring closing chord of “Mean Mr. Mustard” introducing it. It is almost certainly Lennon doing the cursing throughout Hey Jude as he tries to play the bass part. Earl, I thought so too, but most sources agree on McCartney, most likely for hitting a sour note on piano.